Michele and Marcel on a visit to the USA. During the investigation of this case, the author asked a personal friend with clairvoyant ability, Michele Villeneuve, for insight into the murder. 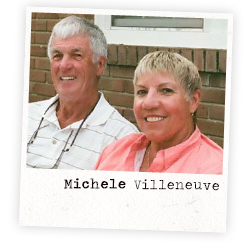 Michele lives in the Gaspe Peninsula of Quebec. Her first language is French. To the author’s knowledge she knew nothing of the case and did not know the author was investigating a crime. When Michele agreed to work on the murder she refused any details of the crime except: the victim’s name, the place of the murder, the date and time of the murder, and the person’s name if someone had been convicted of the crime. Two weeks passed, and Michele reported what she knew from the perspective of the victim. Michele spoke in French, and her husband, Marcel, translated into English. Tim Davis did not kill Mrs. Alford, Michele said. When the murderer came through the door preceding the attack, he had the appearance of a farmer with a large, dark hat. His appearance may have been symbolic. It was hot, and Mrs. Alford’s clothing was sleeveless. Mrs. Alford knew the man and spoke to him. He was angry and spoke bad words to her. He hit her in the face and knocked her down. At some time her clothing was off, and he sexually assaulted her. She was lying face-down; he got behind her, grabbed her hair and pulled her head back, possibly breaking her neck. He beat her in the back, and she lost consciousness. Michele said a child came into the store immediately after the murder, and the killer hid behind a door. Gerald Neighbors’ 10 year old son, Clay, was on foot in the vicinity of Alford’s Grocery the afternoon of the murder. I mention this because Michele said a child came into the store immediately following the murder. Clay Neighbors declined my request for an interview. The most amazing part of the investigation is not that Gerald Neighbors is finally named as a suspect. It is that Gerald Neighbors was never named a suspect. The reason he was never investigated is explained in Part VII.